Faith becomes more personal this week, while love becomes more cautious -- and then turns cautiously optimistic. Read on to see how you can best navigate the twists and turns behind this week's cosmic movement, and see what's going to happen in your near future with a Timeline Tarot reading now. On Monday, the Sun in truth-seeking Sagittarius will conjunct Mercury, while Jupiter, the planet of faith, turns retrograde. With Jupiter in Leo in retrograde, you might decide to go within and really consider what your faith and personal beliefs are. Then, on Wednesday, love planet Venus enters serious Capricorn, where she'll remain until Jan. 3, 2015. With Venus in Capricorn, you might feel more insecure and cautious in matters of the heart, but one thing is certain: If you love someone, you'll be committed to making it work for the long haul. The responsibility associated with partnerships will be emphasized. On Friday, Mercury in Sagittarius will trine Jupiter, followed by the Sun trining Jupiter on Sunday. You'll express your most adventurous "glass half full" thoughts to the world, and in many ways your joy factor will be contagious. 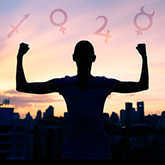 Even romantic matters become blissful because Venus will be at a perfect sextile to Neptune. You'll feel spiritually connected to the one you love.